I am often asked about money when going to Costa Rica. These questions range from how much should I bring (very subjective) to can I use US Dollars in Costa Rica? or another variation such as, should I use US Dollars or Costa Rica Colones? The quick answer is: Both. Personally , I use a combination of dollars and/or colones depending on the situation and where I am at. When using dollars, I want to make things easy on myself so I carry $20 bills or smaller as its accepted a lot more readily than the larger bills. Why do I do this you may ask? For a few reasons, one being that its alot easier for them to have change for smaller bills then larger, also because many “ticos” don’t have a lot of faith in $50 and $100 bills in large part because there have been counterfeit problems in the past (and currently) with those bills, and of course, there is a risk for anyone accepting them. However and with this being said, you would be surprised by the number of businesses and individuals who will accept US currency in Costa Rica. This would include most of the taxi drivers located outside both the airport in San Jose as well as the airport in Liberia. In addition, most major hotels and resorts, large restaurants, and chain supermarkets will accept US dollars. Keep in mind that if you want to pay dollars in small stores, roadside vendors, and local markets they won’t always (basically never) be able to give you back change in dollars . So remember that when you spend your dollars on something in places such as this. don’t expect to get dollars in return, as in almost every case they will give you your change in colones and at that point you will, to a certain extent be leaving it up to them as to what exchange rate they will use to give you back your change. Before going to Costa Rica I think its important that you have an understanding of the currency in Costa Rica and how works for those going as tourists. I don’t want to bore you but let me start of with just a brief history lesson so you have just a little background information on the currency in Costa Rica. 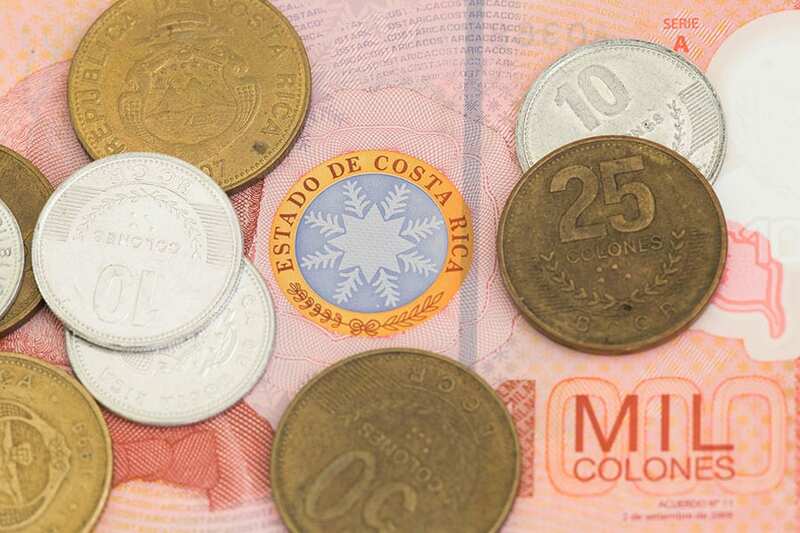 Since 1896 the unit of currency in Costa Rica is the Costa Rican colon. 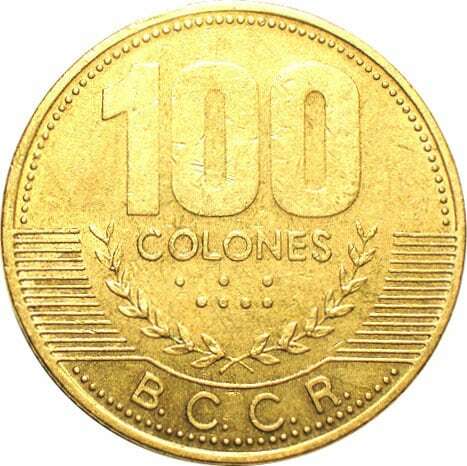 Before the colon, the currency was the peso. Colón means Columbus, Spanish for Christopher Columbus the Italian explorer who “discovered” or explored the Caribbean coast of Costa Rica in 1502 for Spain on his fourth and final voyage to the new world. 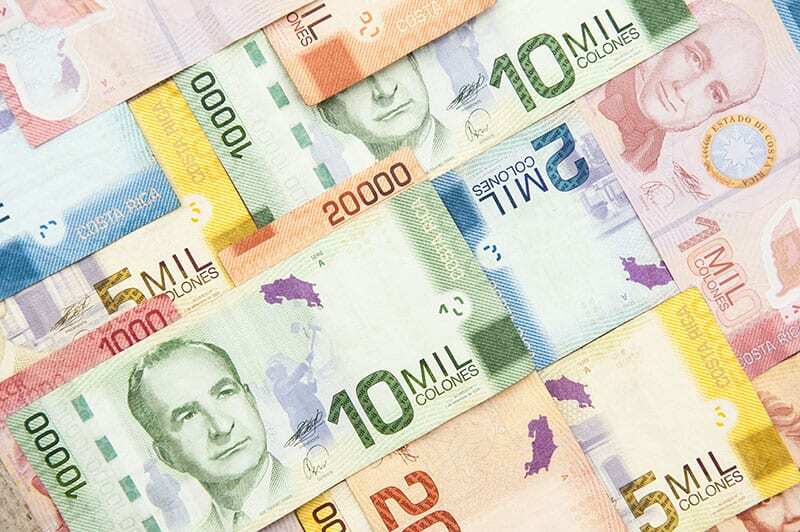 Costa Rica’s currency is the colon, which for exchange rate purposes is identified as “CRC”. The symbol for the colon is a c with two forward slashes (₡). Bills are issued in the following denominations: ₡1,000, ₡2,000, ₡5,000, ₡10,000, ₡20,000 and ₡50,000 colon notes. Each decorative bill features a unique design, highlighting local wildlife, an historical figure, and a Costa Rican ecosystem. The notes range in size from smaller to larger depending on denomination; coins are available in ₡5, ₡10, ₡25, ₡50, ₡100 and ₡500 colones. Try to use these as much as you can before the bills as they are a bit larger and heavier then you may be used to and after awhile you might find yourself leaning to one side! If you plan to use US money in Costa Rica, here are a few tips. Change out whatever you think you’ll spend during your trip at a bank or if the lines are long, at your hotel. The exchange rate won’t be as good but you save ALOT of time, you can then use those colones throughout your trip. When you buy things priced in Dollars, pay in Dollars. When things are priced in the Colón, pay in those. You’ll save on exchange rates. Anything from hotels, to taxis, to clothing, try to pay in whatever currency they are advertised in. Taxi’s prices will always be local Colónes and the amount should be stated on there meter or what is locally called the Maria. Do NOT exchange your US Dollars for Colones before arriving in Costa Rica, not unless you want people see a grown person cry when you see the exchange rate you get! In Costa Rica, try to use an ATM whenever possible as they give fairly good exchange rates. ATMs are available in all of major tourist cities and most likely the ones you will be going to. (If you plan to use your debit card while in Costa Rica, it is a good idea to call your bank and ask about any fees for foreign transactions. )Each ATM machine is different with some accepting Visa and others only Master Card and some accept both. Amex is only accepted in a few ATMS and therefore, unless you have a compelling reason, I would not even bring it. Why don’t they use AMEX more? Part of the reason is due to the exceedingly high percentage they charge for processing the card. Be careful using ATMs as many tricks are used here. Try touse only ATMs that are in shopping Malls or inside stores or banks where it is difficult to alter them. Before you put your card in always check to see if anything is stuck inside the slot where your card goes in. Thieves sometimes put objects like paper clips inside the slot so yours will get stuck and then when you leave it to report the problem they come and take you card. Also beware of anyone behind you watching you type your PIN number. Problems are actually rare but it’s wise anywhere to be to be weary. It should go without saying that you should not use ATMs that are in dark or lonely places at night. NEVER EVER change money in either airport in San Jose or Liberia! While you will be treated fairly in most other locations outside of these two places, changing money at the airport will remove that vacation smile right away. Bring a credit card as well because you need a credit card for medical emergencies should anything happen. Pay attention to how many colones you have toward the end of your trip and make every effort to spend them. If you don’t, you’ll need to get to the airport early to wait in line, pay a substantial commission, and get them converted back to US Dollars at a painful rate. If you’re thinking that you’ll just take them home and convert them at your local bank, I would tell you that I would not do that as very few banks in the US are will accept colones in which case you will have to make plans to come back to Costa Rica so that you can spend that cash! (not a bad deal). If you haven’t prepaid for your hotel, then when you go to check out pay part or all of your bill with the colones you have left. If you don’t have enough to cover the whole bill just ask them to put the remaining balance on your credit card. If you go to Starbucks alot at home and have a Starbucks card then you can go to one in San Jose and add funds in-store in colones. That will then convert to the currency of the country your card is registered in. Refill gas in your rental car. If you’ve rented a car in Costa Rica, you will need stop to refill gas on the way to drop off before you leave. (if not you’ll pay a fortune if they do it). Pay in cash, refill to the amount of cash you’ve got left and then do a separate transaction to get the tank full by paying with a credit card. This is may be the most enjoyable: Spend the remaining cash in Duty Free!